This video was put together by and features Woodrow Wilson School students from the 2018 and 2019 MPA cohorts. These brave and courageous students have helped to advance a school-wide conversation around diversity and inclusion broadly and first-generation and low-income students at the WWS specifically. This conversation led to the formation of a student organization – first. – as a forum for first-generation and low-income students to find community and space to discuss issues important to them. Their video debuted at the 2018 Students and Alumni of Color Symposium (SAOC), a student-led organization that brings together WWS students, alumni and faculty to discuss issues relevant to the social, political and professional development of students of color. SAOC also supports the social and political development of communities of color. 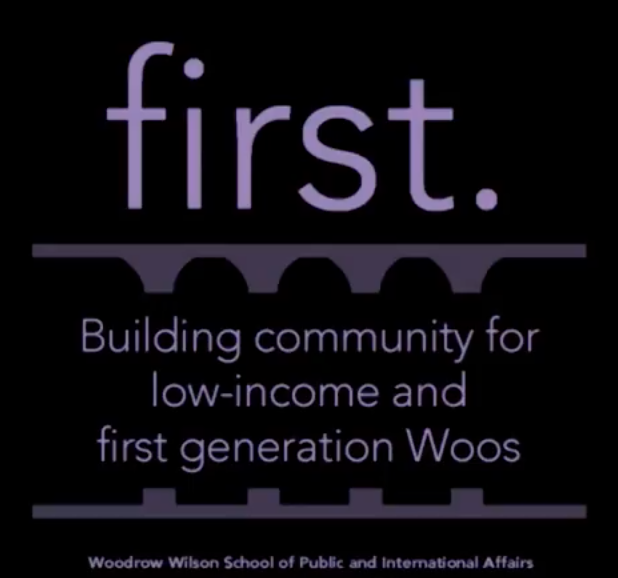 If you are a first-generation or low-income student considering the Woodrow Wilson School, I encourage you to watch the video. I hope it helps you to understand just one of the many important ongoing conversations happening now at the WWS. If you are not a first-generation or low-income student, I still encourage you to watch the video. The stories shared and the perspectives presented are powerful. And it will likewise help you to understand the important issues our students are tackling. I believe the WWS has many great attributes, but we can always continue to get better. Thank you to first. and to all who help push the WWS forward. Onward!